Case in point : "The Tick." It ran on Fox very, very briefly back in 2001. Based on the graphic novel/deconstruction of the genre by the same name, it had a lot going for it. 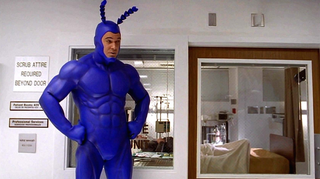 As The Tick, Patrick Warburton got to showcase his specialty, as his character was both egotistical and thick. Nestor Carbonell was was brilliant as Bat Manuel (think Puss in Boots, but wearing a costume that accentuates everything silly about Batman's getup), as was Liz Vassey as the much put-upon American Maid. She was always the only grownup in the room, and all her suggestions would get co-opted by someone else (think Agent 99, but wearing a costume that accentuates everything silly about Wonder Woman's getup). Ben Edlund, creator of the graphic novel, was a writer on the show. Somehow, though, I found "The Tick" to be lesser than the sum of its parts.I tried watching it on Netflix a few months ago, and gave up halfway through the second episode. Broad farce is hard to do (much harder than it looks), because it has to be really smart and really stupid all at once. Like many valiant attempts ("The Naked Gun," "Airplane," "Spaceballs"), it most often achieved one or the other (mostly the other), but never simultaneously. You couldn't have asked for a better cast, but it just didn't quite come together. I may be in the minority on this; I came to the same conclusion about "The Office" and "Arrested Development," too. There's just a point where that much pointed silliness gets tiring to watch. For Warburton's sake I hope I am in the minority, because Amazon is resurrecting "The Tick" for its current pilot season. The show isn't available yet, but Amazon promises it's on the way. No word on the supporting cast, but I'd imagine that anyone who could make time, did make time. I think shows like that are either really wonderful or really horrible to work on, and I'm guessing this tended toward the wonderful. I know why I didn't like "The Office;" simply put, it came way too close to some offices I've actually worked in. Ditto for "Arrested Development;" dysfunctional families aren't fun in real life (at least I've never found them to be), and it's a comedic premise that just doesn't work for me. I don't really know why I thought "The Tick" didn't work—other than there are some stories that really work on the page or as animation, but something gets lost when they try to make a live-action version. For my money, I'd rather see a resurrection of the cartoon series, which didn't have to deal with the logistics of flying and scaling walls (on a very limited budget), or the difficulty that comes from translating cartoons to live action. There's a reason why every superhero film spends a huge amount of its pre-production time trying to work out the costumes. Take a great cartoon superhero uniform and put it on a real person, and the result isn't always great. Maybe "The Tick"'s approach to the costume conundrum was a bit too literal; it ended up having an Uncanny Valley quality for me. So, here's hoping. Do you have a show you know you should like (because all the cool kids did), but it just didn't work for you? Let me know in the comments. Meanwhile, if you've got Amazon Prime, you can watch the pilot and give Amazon your feedback.